This portable, user-friendly Hindi language guide, phrasebook & dictionary is the cheapest and easiest way to learn Hindi before and during your trip. If you only want to purchase one Hindi language book--Essential Hindi is the way to go. Part of Tuttle Publishing's Essential Series, it is a great first introduction and beginner guide to the language of India and is also designed as a Hindi phrasebook, making it the most versatile Hindi language learning tool on the market. 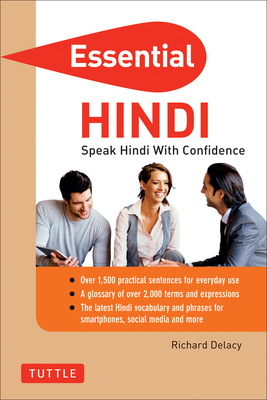 Perfect for business people or tourist traveling to India or for students who want to supplement their learning, this book's easy indexing feature allows it to act as a Hindi phrase book or as an English-Hindi Dictionary. A clever "point to" feature allows you to simply point to a phrase translated in Hindi without the need to say a single word or read a single character. Terms and phrases cover all your conversations via mobile phones, internet, and social media in a way that will help you make the most of the language. In addition, sentences on the essentials of travel make it easier for visitors to navigate the basics of arranging accommodations, dining out, dealing with transportation and emergencies, and much more. Over 1,500 necessary sentences for everyday use. A glossary containing over 2,000 terms and expressions. Extensive notes on Hindi grammar and pronunciation. A handy format for finding the information you need quickly and easily. Look up the latest Hindi vocabulary and phrases for smartphones, blogging, Facebook and Twitter. Let Essential Hindi guide you in making the right word choices when communicating with friends and business colleagues, and the world.